A City whose population doubled from 30 lakhs to 60 lakhs between 1981 and 2004. A City which attracted five MNCs a month between 1995 and 2005 (which should peg their overall figure at least 600). A City which contributes 34% of India’s $50 billion outsourcing revenue. A City a third of whose population lives below the poverty line; nearly 15 lakh in slums. A City only a third of whose garbage is collected. A City which has lost 70 per cent of its trees since 1990. A City where more than half the population is from abroad or other parts of India…. Not fanciful numbers from Upendra‘s “Super“, but cold statistics being bandied about India’s most “globalised” City—and, therefore, India’s most vulnerable City should there be a recession—Bangalore, by global consulting firm$, expat academic$, NGO$ and thinktank$. “A transformation so rapid, from small town to global metropolis, is obviously not easy on those who see change but are not a part of it. So, the 1990s saw the most visible, violent protests against change. This was the decade when farmers and Kannada chauvinists ransacked the first outlet of Kentucky Fried Chicken, picketed multinationals Cargill Seeds and Monsanto, and protested the Ms Universe contest. This entry was posted in Issues and Ideas, IT-BT, IIT-IIM, Kannada & Karnataka, Mysore-Bangalore and tagged Cargill, Churumuri, KFC, Lounge, Mint, Mint Lounge, Monsanto, Ms Universe, Rupa Subramanya Dehejia, Sahridaya Shobhi, Samar Halarnkar, Sans Serif, Super, Upendra. Bookmark the permalink. Maybe you should ask this question to politicians. You can ask the new leaders, when they plan to use the mob and under what circumstances. Like all good Indian politicians they have the people in place, the reserve mob, waiting to be unleashed. I’m a little skeptical about some of the data being bandied about by Halarnkar. Especially the below poverty line and the slum housing part of it. http://wayback.archive.org/web/jsp/Interstitial.jsp?seconds=5&date=1186402713000&url=http%3A%2F%2Fwww.censusindia.net%2Fresults%2Fslum%2Fslum2.html&target=http%3A%2F%2Fweb.archive.org%2Fweb%2F20070806121833%2Fhttp%3A%2F%2Fwww.censusindia.net%2Fresults%2Fslum%2Fslum2.html This puts the figure at 10% on the 2001 census which is misrepresented in a lot of places as double that figure. I think a lot of the peace that Bangalore enjoys is probably because of the nature of the influx to Bangalore contrasted with Bombay, Delhi or Kolkata. The influx has significantly been middle class, lower, upper and (if there is such a thing) middle. This has been due to the surfeit of white collar, as opposed to blue collar, jobs that are being created by foreign investment. Naturally lots of jobs in the informal sector are also created for every white collar job created. Still, Bangalore doesn’t yet have the mega slums one associates with Bombay or Kolkata or the JJ clusters in Delhi with lakhs of people crammed into a square mile. I also find the lumping of “routine clashes” (how routine is still debatable) with protests over KFC to be more than problematic in assessing the allegedly “riotous” nature of Bangalore past. I agree with the overall message of the article. Increased prosperity, jobs and financial security definitely reduces the chance of riots and tensions and violence. This is a worldwide phenomenon, and not just a Bangalore thing. This is the point I have been making on churumuri for more than 3 years now – despite all the rants about IT having taken away “Bangalore’s values”, “outsider influx”, pollution, traffic etc. etc. etc. – overall, IT has been a good thing – a damn good thing. For the locals, outsiders, for Karnataka and for India. India needs jobs and prosperity first. We are not among the filthy rich nations like Denmark and Japan. We do not have the luxury of protesting to preserve “values” and the “charm of old Bangalore” and all that. Riots are mostly engineered by politicians for political gains. Otherwise they are minor flareups like in Shivajinagar etc. Politicians have been busy minting money from mining, real estate etc. Also you don’t need to be in power also to make money with real estate etc giving you good ‘income’. So using communal means has meant more effort for less gain. Also, like the author says the higher middle class grouping also means less likely to have the same effect as back in the early 1990s. The “Development” of Bangalore is sometimes not “Development of Bangaloreans”. What happened to garment industry in Bangalore, which employed tens of thousands of people (mainly women)? Where are they now? What was their contribution to develop Bangalore in the initial stage? Can they still stay in Bangalore? If so, where? I agree that if some of these Bangaloreans had legally or illegally owned any piece of land, they would have survived, by selling of their land and moving into outskirts. Or building a house and renting out. But the real question is how many of the ordinary citizens of Bangalore of 1960s, 1970s and 1980s had their own land and houses? What happened to those who never got an opportunity to buy land/house here? Where do they stay? If they are educated, probably they might have got a good job. But what happened to the rest, who were less educated? For example, in the late 1980s, Bangalore was one of the less literate cities in India and within Karnataka, it was far behind South Canara and other regions. When you say more than 60 % of Bangaloreans of early 1990s lacked high education (the number could be more), that indicates a serious issue. The majority of Bangalorean who built this city were mercilessly thrown out. There is a mentioning of lack of slums. Most locations where there was slums earlier are now occupied by huge apartment blocks. This show that, when other cities still allow the slum dwellers to survive by doing small jobs, the city of Bangalore is throwing them out. (Well, may or may not compensated.). A lady who looked after buffaloes told me that she was living where the palatial houses were located. But they were paid just 10,000 rupees as compensation. When the minimum rate of a house/apartment in Bangalore around 30,00,000 INR, how do you expect illiterate and semi-literate Bangaloreans getting benefited due to IT Boom. Sure, people like Varthur Prakash has got benefited. But it is a wrong premise that, all in a society will be crooked/efficient/smart enough to understand the rules of new world and survive. Most people might have moved out of cities or their standard of life has deteriorated. One normal complaint one can hear in Bangalore is about Autorickshaw drivers. There are more than 1 lakh auto drivers in Bangalore but with license only very few. Most of them live in a one room kitchen houses with large families. Many of these people once migrated from different parts of Karnataka and they all lived in big houses in their own land. Obviously they dont even have a comfortable marriage life. And every one accuse them as rude and cheats. Right now they dont organize themselves and conduct violent agitations. But they are one of the many thousands of victims. As long as there is high liquidity in the system, they wont organize and protest in a systematic way. They will only try to make quick money by hook or by crook. And till there is no major crisis, this will go on. Once Bangalore gets into major problem the new rich and elites will be surrounded by these victims. Another section is City Taxi drivers. They all sleep in the taxi itself in the night. Very rarely they have normal life with their families. No wonder people accuse there are many criminal element among them. You look at any big constructoin site in Bangalore. How the unorganized workers are living. Till the construction is over, they live in inhuman situations. But DEFINITELY they dont come under the definition of slums. Where do they educate their children? Are these children grow up into responsible citizens tomorrow? At least a slum dweller has an address. As I mentioned earlier, agricultural workers. What happened to them. Every one knows that South Bangalore’s land-owning and the social representation. Many people belonging to certain castes didnt have any land but they were all living there. What happened to them? Where did they go? I would say many of these members perhaps outnumbered land-owning families, though they were living in smaller areas in colonies etc. The land-owning groups of South Bangalore, sure might have benefited. But what about the majority? Where are they now? Another interesting thing is a “special Indian goverment policy” . It was widely reported that, people in Govt deliberately forced many of the profitable Public Sector Companies into loss, and later citing that, these PSUs are any way in loss, hence close down them. There was a leading article in second half of 1990s about how some of the Telephone companies of India were forced to make losses (See Frontline old issues), Another example is NGEF by our SM Krishna. When SM Krishna close down NGEF and hand over the land to Shobha Developers, it was even questioned by Prestige Developers as they quoted more, but denied. What happened to those workers who were working in these Public Sector companies, and other private companies? Another big issue is related to the shift of Govt focus to IT industry. Governments deliberaely ignored old companies. What would have happened if packages were anounced to modernized old industries. One of my first memory about Bangalore is the huge sign boards of Mysore Lamps. What happened to that now? Forcing the traditional industy to close down and move out of the prime location is a strategy. It was implemented in Delhi with the help of corrupt (and honest) judges, citing the example of pollution. The same thing is true about Bangalore. If these companies were allowed to run in profit, these new private groups would not have been able to grab it for throw away prices. And that expensive land is almost freely gifted to become part of their capital asset. Let us not compare the slums of Mumbai and Kolkotta. There is a huge refugee problem in Kolkatta. Mumbai did not become a massive slum over-night. Bangalore’s boom is a relatively recent phenomenon. According to me one of the disastrous effect of IT Boom in Bangalore is that, the capital for other industry and agriculture moved into big cities. Say for example most of the land-lords in rural areas realized that dong agricultural activity is less profitable and more risky. Instead, they moved their wealth to cities and invested in real -estate and other business where they could get quicker and more return. As a result of this, the essential resource required to sustain the Agricultural activities in rural areas is no more available. And thousands or lakhs of people became job-less in rural areas. Some of them were forced to migrate into cities for daily wages. Yet ohers were forced to divide the available jobs between them. As a result of this, and as lack of production activity forced the working class and unorganized labourers to get additcted to many bad habits, these sections are all in debt. In fact, it is almost impossible to find any family in Karnataka who are not in debt. Most of them are in debt more than 30 thousand to 2 or lakhs. Many of the old traders and land-owners became financiers in the rural and semi-urban areas. And they give money for high interest. As a result of this the ordinary people in the entire state of Karnataka is getting into deeper and deeper debt. But the whole resorces from the entire Karnataka is now moving to cities. They are ultimately adding to the “liquidity” visible in cities. One reason why you dont find large number of slum dwellers in Bangalore is obvious if you go to central railway station in Saturday nights. Thousands of workers are commuting daily or weekly to Bangalore. For example, people from Kolar, Mathur, Mandya, Channap Patna, Tumkur , Hassan etc are commuting to Bangalore on a daily or weekly basis. What does this mean? There wont be more expansion of the employee base of major IT industries in Bangalore. However, they may expand their base in other cities (within and outside India). One has to understand that, unlike early 1990s, new players cant come up in software field now. In the coming years, bigger companies will take over smaller companies and small players will be wiped off from market. 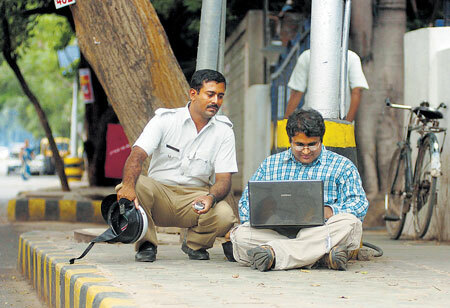 when the over all number of IT employees come down in Bangalore, which industry can absorb them? Please think of it. It is essentially serving a westen export market. And their employees are highly paid. A local industry can not give similar salary to any other employee. The higher real-estate price will not allow a new industry to come up in place of IT in the future. When you have millions of people living in a small location and if more jobs are not created, how do you expect to maintain the expenses? For example, there were over one lakh apartments/houses vacant just when the recession started this time (2007-8). All these employees are supposed to pay monthly EMIs. Agree. They may pay- at least a large number of them. But the question is if you are paying an EMI of 40 thousand or more, and if your children dont have much chance of getting a job in Bangalore after 10 years, which devil you expect to rent out your apartment? Again, let us say, some people will manage to do it. But why these apartments are still vacant? Do you know that these apartments have a life? I am almost sure, that many of Bangalore children wil be forced to move to Gurgaon or other cities (including Mysore looking for a job in the future. What essentially I say is, who ever build bangalore, they are later kicked out of the system. May be you have enogh NRIs and foreigners an super rich ready to come and live in this city. But the problem is, every indian town is trying to become an IT hub. Cochin and Mysore are DEFINITELY GONIG TO BE CHEAPER than Bangalore. And basically we are building all these glass houses and ghost cities where our future generation will struggle to find a job. The Corporate will keep moving to where ever cheaper skilled jobs are aailable. The liquidity will ensure each city become costly over the years. And logically this will not go on and on for ever. Some time, this will collapse. You wont find big riots and strike in a city, when there is a lot of liquidity in a system. But when the crisis become serious, and when people start losing, there will be massive violence in Bangalore. Honestly I am waiting for that. Though, I really wish, if I have the power to avoid it. Add to this mix, it is likely that the US will start discouraging its companies from outsourcing jobs in the service sector. Software itself is changing in a way that will make many of the low end jobs in call centers and software companies to be automated away. Indian software companies haven’t shown any ability to get into real hardware, products or even hosting high end data centers. Unlike manufacturing companies, Bangalore will be left with a good portion of the IT workforce who will not be able to transfer their skills to anything useful for the local market. In addition to the land grabbing and tax evasion which is tolerated by the government, most of Bangalore’s low cost software centers are made possible by the low wages and bad conditions endured by the cleaners, drivers, construction workers, cooks, attenders, security staff, gardeners and others who allow for the labor arbitrage. These workers however are different from labor in Indian villages in that they too aspire for material wealth and want to move up the ladder. When their wages starts drying up and they will not take it lying down but will react with anger. If and when there IT outsourcing in Bangalore takes a hit, there would be a price to pay. Desi shops like Infy haven’t shown any flair to get into anything beyond cost-differential outsourcing, I agree. However, we have the IBMs and the Adobes and the GEs here too. As long as there are companies in the West and low costs in India, IT outsourcing will continue in one form or the other. No matter how much the US starts ‘discouraging service outsourcing’ – it will continue in some form or the other. But you are right in that Bangalore must diversify its economy and create a variety of jobs here. Not just Bangalore, every city in India seems to be trying to “attract IT”. As Shemej pointed out, our administrators do not know anything beyond IT. I do wonder what we IT folks will do in a real horror scenario such as you describe – our skills will not be tuned to the local market. Unless of course, we get a sizable number of domestic clients. But then those domestic clients will not be able to maintain the rates of pay that the Western outsourcers pay today. Certainly something to ponder about. As regards this article though, the “IT boom” has certainly helped Bangalore in many ways – in the net analysis, Bangalore has hugely benefited from it. Rather than crib about the traffic and pollution that “evil IT” has brought upon our city, what we really need to wish for is alternative industries to come up in Bangalore and additional “booms” to take place in Bangalore in the coming decade. “It is not known why IT/BT industries require hundreds of acres when they work in small air conditioned offices.” – Karnataka Minister Basavaraj Bommai. “Scrap concept of land bank: Bommai” – Minister Basavaraj Bommai. –Quoted from Deccan Heralad Dated 14th August 2011. Comment– Minister demands criminal cases should be slapped against IT BT (and other) industrialists which use Govt alloted land for entertainment projects, townships and other non-industrial projects. When Narayanamurthy will be send to jail? Does the Government plan to prosecute the Corporates heads who was part of Bangalore Agenda Task Force (which was an extra-constitutional body , hence should be answerable for diverting the Public resource for Private purpose, (If they are not punishable how can Yeddyurappa’s son be prosecuted?). And when A. Raja is in Jail, why SM Krishna is not in Jail? I totally agree that IT companies can work out of highrises in the CBD (Central Business District). I agree that having huge horizontal growth and massive campuses is not essential – skyscrapers and highrises will suffice. But then, I am not sure about your quotes regarding “using Govt. allotted land for entertainment projects, townships, etc. etc.”. Can you point me to an instance where one of our IT-vity companies has used land for “townships” or “entertainment projects”? @Shemej – You raise some very good points. As you pointed out, a good number of the local population especially from the poorer sections of the society have not completely integrated into the new economy of Bangalore. Many people from these sections who make a living in Bangalore commute from the outskirts or even other cities as they cannot afford the high living standards. A high percentage of them are getting into debt to meet their expenses and suffer badly at the hands of loan sharks. In the past poorer sections lived closer to the city and would manage to get by, even if they did not all get into white collar professions as living expenses were manageable. Moreover the competition for certain kinds of jobs such as construction labor was limited. Nowadays, a better proportion of the middle class people from the state are getting jobs in the technology sector as compared to earlier when many companies felt that there was a shortage of the right talent locally and looked to recruit people from other states. The challenge for this group would be when the economy takes some beating. Many of the jobs they do may still remain but not all would be as high paying as they are today. “Nasdaq-listed Infosys Technologies, for example, is the first to get off the blocks. The information technology major has set up an in-house 500 room hotel-like complex christened ‘Le Terrace’, equivalent to a four-star hotel, for its clients and visitors coming to Bangalore. The hotel is managed by the company, which had 36,750 employees of 53 nationalities in different parts of the world, mostly in Bangalore, as on March 31 this year. But the point is not even that. The point is in a place where land is at a premium, why is an IT company alloted inordinate amounts of land at throwaway rates? Twenty years from now, if IT outsourcing peters out, who will end up the winner with hundreds of acres of prime land? Since there is no real intellectual property, manufacturing base, product pipeline, a real consumer base or any other legacy- what do you think the real assets of the company will be? Currently real estate is the true wealth in Bangalore, as it is in any developing mega-city(slum?) in India. When Bangalore becomes Bombay, those with these 100s of acres of contiguous land will be the true winners and modern day maharajas. Usual rehtoric based on false facts. 1. Both Infosys and Wipro have SEZ in Bangalore. In addition to those elsewhere. Recently BSY donated 250 acres to Infosys on Sarjapura Road. 2. Your unsubstantiated belief in the merit for PSUs. You say when IT goes down the staff cannot be retrained but rue govt. didn’t try to remake PSU with new projects. A workforce given to modern day work ethics won’t be able to retrain but a workforce given to sloth and inefficiency will jump into their shoes and do their new job as if it was prayer to god? HAve you even treid running a small work shop, learned economist? Very few PSUs make profit and even then its because many of the expenses are picked up else where ans doesn’t appear on their balance sheet. When Mysore soaps was founded by Vishwehawarayya arranged for a 100 yrs sandalwood contract with the forest dept at Rs1/- per Kg. That rate continued till date and consequential the forest dept. had to pick up the tab. Recently forest dept. couldn’t find enough trees in Karnataka and to meet their contractual agreement had to buy the wood from TN forest dept. 3. Right now shemej rues giving away land to companies; but in 60s, 70s, 80s and 90s that what BDA did with their sites. Most of the Brahmins who now live in Jaynagar, Malleshwaram, Sheshadripuram, Vijayanagar, Rajajinagar got their sites that way at below the market price. Why? BDA newer allowed private layouts and always set the land price 10 times lower than the market price. Consequently middle class allottees benefited but farmers suffered brutally. And there was even worst case where compensation was based on price of developed land. Since parks and civic amenities sites don’t have any resale price, those land takeup for the purpose got paid pittance. The learned and the intellectuals never remonstrated because they were the beneficiaries. 2000 onwards politicians used same law to allot land to companies instead of middle class people. And people like shemej started complaining. Today its impossible for a middle class person to get a BDA then how did all the brahmins in the foresaid localities get their site? you too? For what its worth atleast Infy earns some money for the gov’t, compared to all the humongous ‘public sector’ estanblishments in blr. Ya they do have excess land, but that comes with the clout they managed to earn. One of the early ones to become middle class? So, these things that Infosys has built – golf course, hotel etc. – is it for the general public or only for Infosys employees? If it is the latter, how is it different from the thousands of hectares of land used by dozens of PSUs, complete with “staff quarters”, “club”, “gymkhana”, etc. etc. etc.? Why this hate for “IT-vity” and love for PSUs? Misplaced nostalgia maybe? And “M” makes a very good point above – this “giving away land” is exactly what BDA has been doing throughout its existence, isn’t it? Why the love for BDA and hate for IT-vity? If the Infys and Wipros were to rent out their hotels and golf courses to the general public and make a business out of it, I can understand Shemej’s argument. But calling for Murthy’s “Arrest” for building facilities exclusively for his employees is a bit over-the-top, don’t you think? I call it most stupid and arrogant. OK, so our “saaftware companies” want to use the real-estate on which they sit as a hedge to exit profitably sometime in future, should that scenario arise. To that end, they lobby the government to give them land – and through the English media, they apply pressure on the politicians to give in to them. Well, this is a hundred times better than what happens in other areas such as road contracts, mining, and so on – at least there is no violence, extortion, rampant corruption, purchase of the state organs, etc. here. And one more point about these giant land holdings. Lots of self-styled “experts” and pundits write reams about “lack of urbanization”, “faulty urban planning”, and so on and so forth. One school of thought is that instead of “putting more pressure on our cities”, new offices should be set up in the “outskirts”, around 115 km outside the city, and these new office campuses should be self contained. That is the prescription given by quite a few “Experts”. Now, isn’t this exactly what our IT-city companies have done? E-city, Whitefield, Sarjapura, etc. all qualified as “outskirts” when the campuses were built. Over a period of 10-11 years, the city expanded to encompass these localities – but the fact remains that when these offices were built, they weren’t anywhere near the city in the first place. Excellent points. I have this feeling that most of the rants against IT-vity are out of jealousy and a feeling of being “left out”. Even though some of the points are valid, the anti-IT brigade refuses to apply the same yardstick to other industries/organizations. There is this special hate for IT, that manifests itself in constant rants and grumbling. Agreed that calling for arrest of IT CEOs etc. is purely political talk. IT organizations cant be compared to criminal mining, real estate type activity. But why compare the two? Let us look at IT in its own light. I think it would be best for the industry if it were disassociated from the normal corruption and nepotism which effects our society as far as possible. I believe the IT industry in India is not able to make the leap forward primarily because it is stuck in the model of using government sops, leveraging land and labor costs and building real estate assets. Only MNCs are able to come in and setup shop in the current eco-system. Besides the big labor IT shops, no new companies or start up are coming up or producing anything of value. In this way the IT industry of Bangalore today is no different from the PSUs of yesterday. I would say the PSUs contributed to the IT industry in Bangalore today (in their inefficient ways). Why do you think Bangalore became the IT capital of India as opposed to say Calcutta or Madras? This thread is now fast changing with several questions asked and answered. By the time, I could prepare some answer, Anonymous Guy has come with same link I planed to provide. And he has given more than what I could find. The Rediff article about Infosys hotel was never seen by me earlier. Thanks for that link. I am startled by this question. Obviously, the respected questioner is either relatively new to Bangalore (India) or he is too busy with his works to glance through the daily news. Before, I coming to the answer, let me clarify that, the quoted word is not mine. But a Karnataka Minister’s. Obviously minister has some valid reasons for demanding a probe (Land Audit). Many Software companies build Residential Apartments and rent out on a daily basis. Infosys has hundreds of such Flats in Bangalore. Well, these land was forcefully acquired by giving throw-away prices. And please see the URL I gave in my earlier post to read the connection between Land and Software business. The question is — Why cant they pay market price to landowners? (Please consider that these prices may jump several times in the not so long future. And the land-owner has every right to ask a premium. But in the name of Software companies, Goverment allot almost freely. (Just because many so called pro-Business Chief Minsters are share-holders or partners in these companies. After acquiring this land by evicting poor land owners, they build software empire, and then cleverly divert the Fund to Family run business or family controlled charitable Society groups. Please note the Satyam – Maytas Fraud, for example. The only reason why educated people disbelieve these things, these people use Corporate media to build a good image about their business activities. In fact there is not much difference between an ordinary rowdy real estate broker and such frauds, who evict residents and land owners with force and then divert the fund and profit to family. But the Software barons build a good image using corporate media. An ordinary rowdy real-estate agent dont try to build this image. In fact many Top guys in these so called Software companies are just frauds. Till Ramalinga Raju admitted the fraud, he was hailed as the honest and visionary leader of India. “Ten thousand employees work in the twin buildings for Bell South in America. More than 5,000 work in a single office complex for AT&T. …..
Infosys’ global headquarters and campus at the Electronics City, Bangalore, is the world’s single largest software development facility among IT services companies. The company has large campuses and facilities at various development centres in India. These centres ….also include facilities for ongoing education, fitness, sports, and multi-cuisine cafeterias. How many acres of land does Infosys own? But rough estimates — provided by sources at Bangalore-based builder Sobha Developers, the real development firm that is in charge of executing Infosys campuses — indicates that the company owns hundreds of acres of land across India, where it has built, and is continuing to build, huge campuses. … years ago, Infosys came under attack from villagers in Bellandur who alleged that the IT major was buying wetland at rates much lower than prevailing market rates. According to the villagers, the price of land in the Bellandur area ranged from Rs 40 lakh (Rs 4 million) to Rs 1.5 crore (Rs 15 million) in 2003. But the Karnataka Industrial Areas Development Board agreed to sell 100 acres to Infosys at a uniform rate of Rs 9 lakh (Rs 900,000) per acre. However, it was not executed because of the controversy. Currently, Infosys owns only 80 acres of land in Bangalore where it employs nearly 25,000 people. But the company has applied for 845 acres of land on the outskirts of Bangalore and requested KIADB to acquire the land after securing zoning requirements from the government and complying with the law. The land is being acquired on a consent basis and after paying the market price to the landowners. The land in Bangalore has been sought as two different plots. On one plot of land, a software development center will be set up, which will generate employment for 25,000 people. The second plot of land is being sought, a short distance away, to provide residential facilities for our employees and to set up essential amenities like a school and a hospital. This will provide Infoscions with a better quality of life and avoid long commutes. The second largest Infosys campus, after Bangalore, will be in Hyderabad. The company is building a huge campus in the city spread over 550 acres of land. Infosys already has a campus over 50 acres in Hyderabad. Early this year, the Andhra Pradesh government sold 550 acres of land to Infosys at Rs 12 lakh (Rs 1.2 million) per acre: a low price in booming Hyderabad. In fact this is very old. During Dharamsingh-JD(S) goverment, they coerced govt to allot land, but HD Devegowda opposed. But later his own “business man” son HD Kumara Swamy alloted 700 acres of land for Infosys. There are strong views expressed here. I would say, otherwise informed people make sweeping remarks because they are misguided. This blind support about IT companies etc are coming from wrong conclusions. It is very difficult to break these blind beliefs because, they are just what they are– blind beliefs. Our respected readers are basing their arguments on a series of wrong premises. If I have to explain my points, I have to first expose these wrong premises, one by one. Let me examine one of the theory– that Govt companies are any way loss making. Why support them. Close down them and help IT companies come up in place of them. This is a dangerous argument. In fact Corporate lobbyists and Corporate media have been doing this false campaign to misguide the public for long. They do a propaganda saying, Public Sector Companies are at loss, let us privatise them. The corrupt ministers give away these companies at throw away prices. Progressive sections do question this scam, but many are either carried away by these false propaganda or just dont care or lack civil sense and ethics. The statistics talk about themselves. Please see below. Most Central Public Sector Undertakings are profit making ones. All these years, Pramod Mahajans and Rajas were helping Reliance and TATAs to fool public and they forced Indian companies to run in loss. But, just when some honest judges started acting tough, the profit of Reliance started falling down. This shows, how Private corporates were making profits all these years. 1) ONGC (net profit of Rs16,785 crore) has retained top position on the coveted list of 10 profit-making PSUs, while Air India (Net Loss Rs5,614.29 crore) was the biggest loss-making state firm on the list of worst performers during the 2009-10 fiscal. 3) power major NTPC to the third position, said the Public Enterprises Survey. Other than Air India MTNL and BSNL are making losses. This is mainly because, other Private Telecom companies are helped by govt accepting kickbacks. If you say, Air India is in loss, you also needs to note that, almost all Private Airline companies in India are surviving only because of the Govt support. They owe Govt companies hundreds of crores of rupees if not thousands of crores of rupees. Almost every day Vijay Mallya and his top executives are lobbying with ministers to save its business empire which is in thousands of crores of rupees in loss. It is surviving only because SM Krishna, Manmohan Singh, Sharad Pawar and Congress leaders are close to Mallya. The public Sector companies are making losses is absolutely wrong. This doesnt have any base. In most cases, where PSUs are making losses, either it is because there is a known case of Ministers and People in Govt deliberately tying to help private players at the cost of PSUs or Govt consider that the interest of large number of workers have to be protected. In many cases, India (and various state govts) where forced to take over loss making Private companies, only to protect the interest of the employees. Though, I am not an economist or a journalist, what ever I can get info from available sources, more and more PSUs in India are making profit. d) Most of the loss making PSUs are actually State Govt controlled PSUs and in most cases, these State Govts are known for their corruption and in some cases, Govt had to protect the interest of employees.Where ever there is a relatively less corrupt Govt in power, in those states, State PSUs are actually profitable. For example, during the 5 years of CPI(M) led LDF Govt in Kerala, it turned around from 12 to 32 profit making PSUs and from a loss of about Rs.70 crore to a profit of Rs.232 crore. e) 25% of India’s GDP is contributed by PSUs. f) 27% of total Industrial output is by PSUs. –Now, if you still argue that, some of the State Level Public Sector companies are in loss, then people like SM Krishna and Reddys are responsible for that.Why elect them? @ vinay & others, when KIADB / Govt allots land to an industry it is for a specific purpose. When infosys wanted land , they applied saying they want to build their offices & not for a golf course or a 400 room hotel. Change of land use means immediate cancellation of land allotment. if infosys wants to build a hotel in the land they should apply & get approval for change of land usage. Infact the IT companies of electronic city , who are the most vocal in demanding better amenities from bangalore city corporation, do not pay a single rupee of tax to palike. They have been all along opposing paying tax to palike & pay a pittance to some grama panchayat there. They want aall amenities from palike, but will not pay tax to it ! 1. Is Infosys building all these hotels and golf courses for the general public or for its own employees? If it is the latter, how is it different from the thousands of hectares of land owned by PSUs to accommodate their “staff quarters”, “gymkhana”, “club”, etc.? After all, people don’t have space to sleep in Bangalore, how dare these PSUs sit on immeasurably large tracts of land in Bangalore! 2. Why do you people moan about software companies “eating up land”, but are delighted with the BDA acquiring the land of “pooooor formers” to provide subsidized 60 X 40 sites for you? People don’t have place to sleep in Bangalore, why should the BDA subsidize large tracts of land for the likes of you to build “duplex mane”? Time you all started living in 1000 square feet apartments. All you have done is the pick the list of top 6 profit making PSUs and typed it in here. How about typing in the list of all loss making PSUs too, both central and state? And actually, even if true, the statistics that you have provided are hogwash, simply because any entity will perform well and contribute “x per cent” to India’s GDP, if they are allowed to operate in an environment without any competition, and are the only player out there. What’s with praising Oil and Gas PSUs to the sky, when they are the only players in town? Let us have private players come in, and let the government pass the Diesel subsidy to private players. Then we will see. Adulteration, nepotism, allotment of petrol pump license to goondas – this is what your wonderful PSUs have given us. Already, lots of drivers in Bangalore go ONLY to Shell, as far as possible. In their current form, your great PSU oil majors will be kicked out by the public as soon as proper competition is allowed. This quasi-socialist thinking worked only as long as people in India couldn’t see for themselves that the giant PSUs were actually predatory. Do you think we are all blind here? We can see the kind of service that one gets in a PSU bank. We can see the kind of service and facilities that one gets from an Airtel or a Vodafone, compared to BSNL and MTNL. It never ceases to amaze me when I see this love for PSUs, to the extent that anything done by the PSU is forgiven, whereas even a slight misdemeanor by “Saaaftware companies” is castigated. @shemej, a general suggestion – keep your posts to 20~30 lines. Otherwise people won’t read your posts. Coming to your points, the premise on which your arguments are based is wrong. Leaving Mysore training center, can you tell one other Infosys campus that has a multiplex? And one hotel run by Infosys? And one residential apartment built by Infosys? Just in case Infosys is comforning to KIADB rules, what stops the Govt/KIADB to serve a notice to Infosys? The fact is Infosys have played their game withing KIADB & Govt rules. If you have any problem their take it to Govt. I agree with you about our Desi software companies. Even I find it frustrating and disappointing that they don’t seem to want to go anywhere beyond code coolie work. However, we must make a distinction between “Indian IT companies” and “IT companies in India”. We do have the Oracles and Googles and Intels here too. I work in a consulting company, where there is no ‘coolie’ work. Desi consultants like me travel to the client site for implementations, we spend on our private India credit cards, get all expenses reimbursed (“actuals”), and come back to work from home till the next time we need to travel. So, if you talk about the Desi giants like Infy and Wipro, you will be disappointed. But if we look from an overall perspective of Bangalore (or India), things are more cheerful. Whenever a fresher asks me where he should join, I make sure that he understands that joining a Desi giant is the worst possible thing he can do. A lot of violence can be traced back to feeling ‘left out’. So let’s not skim over that particular facet of society as if it were nothing. This thread has become interesting as for once we Indians have started to talk with raw facts in hand. I notice that there is a pro IT and anti -IT faction. I’m neither of them. IT was a god-send for India. (1)It helped us get out of the controlled economy. (2) People’s perceptions became global. General knowledge and analytical skill of an average Indian, be it literate or illiterate, is atleast 10 fold higher now. (3) Young people now go to college for a PURPOSE rather than for ENNNJAY MADOKKE. (4) Expanded middle class by bringing in more people from more communities.In the past this class was predominantly Bhraminical. Unlike other professions/businesses IT is highly vocal: its the largest employer of brahmins who in turn are dominant in journalistic media and also in lay media like face book, twitter, and blogs like this. They in turn turned began the hagiography of Murthy and induced the whole country to think that IT was Murthy’s brain-child. The fact that TCS was in operation for a decade even before Infosys was founded was easily brushed aside. Murthys = Infosys was overwritten into Murthy = IT India. Murthy in turn used (or abused) this image to bolster the prospects of Infosys. It became impossible for politicians to question him. When Deve Gowda asked why he wanted 2000 acres when WIPRO which was bigger than Infosys had only asked for 50 acres., the public campaign began. Given the uncouth nature of Gowda and his dirty politics it was very easy to turn the public opinion against him. Brahminical hagiography is an age old art. For e.g. all the contributions of generations of benevolent Woyedars of Mysore is singularly attributed to Vishweshwarayya . The fact that the Maharaja’s separated the Royal Fund from General Fund is totally ignored. Instead of gouging the public the Maharaja’s chose to bolster Royal Fund by INVESTING in public projects as PALACE SHARE is ignored. Should I be greatful to my parents for building a house or my the engineer these chose to build it for them? Infosys created economic schism in the local community by employing predominantly brahmins. And because of this the profits of Infosys didn’t percolate down to the bulk of Kannadigas. Only when their employee requirement became huge and kannada activists started complaining did they start employing more locals. But by then the glossy paychecks had started to lose its shine. These are not my opinions. These are screaming headlines appearing National News Papers in India. When I cautioned against giving over-emphasis on IT and Software industry at the cost of Local Business, agriculture and manufacturing business which can ensure more employment opportunity for a sustained period, I was frowned upon. Nasscom is now advising that Indian Software – Outsourcing companies should now focus on Non-English markets. One has to understand that these so called Non-English markets were the Outsourcing destinations (electronic industry and manufacturing industry) of the west during 1960s. Why didnt Indian software companies focus these markets earlier? Obviously the margin was less. Indian software companies were just playing on the price difference all these years. And a small group of Professionals thought they can eternally hope to get good salary checks. But the stark reality is that, outsourcing business would add to the inflation of local market over a period of time and would kill itself, in that process. Infosys is not ready to work for lower profit margins. And even if they are going to ready our software professionals would refuse to work for 12 hours for peanuts. What will happen to thousands of acres of land allotted to Infosys. If Infosys is not going to provide jobs to local people in the future, why shouldnt Indian Judiciary step in and take those land back from Infosys? After all, the corrupt government heads were claiming that Infosys (and other companies) would provide jobs to Locals or bring foreign money to Inida and that is was the excuse they said for gifting lands to these companies. No one is asking Infosys to close down. Let them compete in the market and survive, just like any other company in the world. However under the Indian constitution (if my understanding is right about Indian constitution), no government can say a lie and take some one’s land and freely gift to others. If government authorities have cited one excuse earlier, and if that excuse is found to be untrue, then according to me the judiciary should step in and take back the already allotted land to these companies. Why should Indian government give land to a company to recruit Chinese or Mexican software consultants? That is strange. I dont say Government should do anything against Infosys. The only point is that the Government should take back the land which is allotted earlier, and continue to support Infosys to deliver its good business by competing with other companies in the market. M and shemej are right. The smog over the truth has to be removed. So you’re back after 1.5 years. No one is disagreeing that IT companies ought to buy land at market rates and build their campuses at prevailing rates. That will force them to buy smaller plots of land, closer to the city center, and go vertical – which will in turn prevent urban sprawl and will give our city a great skyline to boot. That said, when can we expect looooong posts from you about the wasteful land usage of the giant PSUs in Bangalore and other cities of India? For the kind of “research” that the HALs and NALs and DRDOs and BELs do and the output they deliver, I fail to understand why they need so many hectares of land. Why this misplaced love for PSUs and so much angst only against IT-vity? When we churumuri readers start seeing loooooong posts from you about the need for these PSU lands to be taken over for better purposes – housing, roads, mass transit, entertainment infrastructure – then at least we’ll know that you are not biased and have no personal agenda in this.